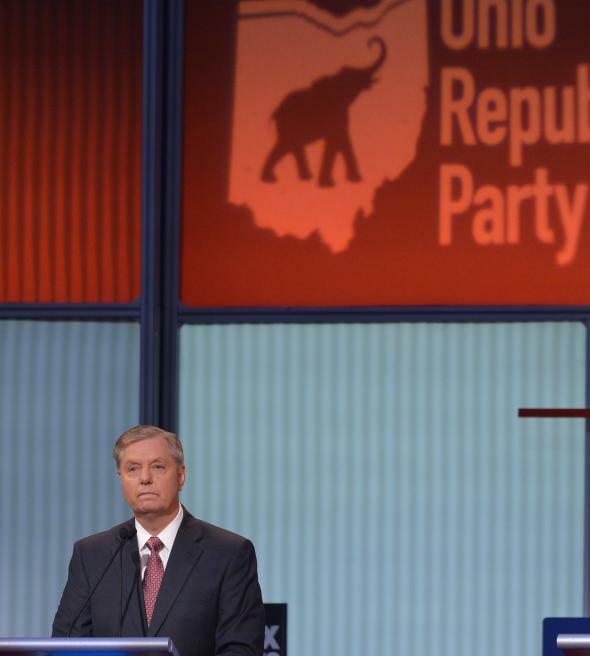 Lindsey Graham: Sad biography at Fox debate. Lindsey Graham was subdued, almost morose during much of the early Republican debate—never more so than when moderator Martha MacCallum cited a number of famous presidential slogans (“We have nothing to fear but fear itself,” etc.) and asked candidates how they could inspire Americans in similar fashion. Graham answered by saying that he was poor when his parents died and now he’s old and childless and as such doesn’t need Social Security. First thing, I’d tell the American people whatever it takes to defend our nation, I will do. To the one percent who’ve been fighting this war for over a decade, I’ll try my best to be a Commander-in-Chief worthy of your sacrifice. We’re going to lose Social Security and Medicare if Republicans and Democrats do not come together and find a solution like Ronald Reagan and Tip O’Neill. I will be the Ronald Reagan if I can find a Tip O’Neill. When I was 21 my mom died, when I was 22 my dad died. We owned a liquor store, a restaurant, and a bar and we lived in the back. Every penny we got from Social Security because my sister was a minor we needed. Today I’m 60, I’m not married, I don’t have any kids. I would give up some Social Security to save the system that Americans are gonna depend on now and in the future. Half of American seniors would be in poverty without a Social Security check. If you make me your president I will put the country ahead of the party. I’m going to do what it takes to defend this nation. This nation has been great to me and that’s the only way I know to pay you back. Graham has been averaging less than 1 percent in 2016 primary polls.